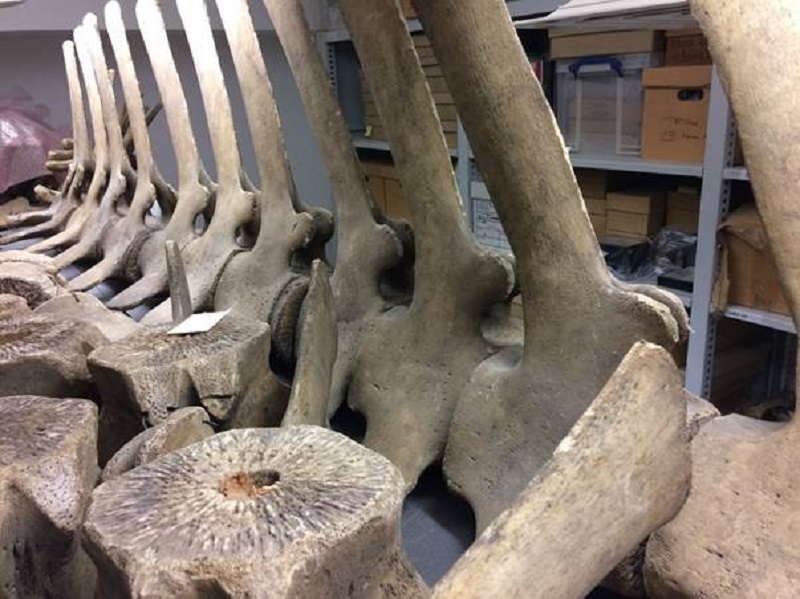 The Grant Museum of Zoology, UCL, is calling for members of the public to help rebuild its largest specimen, a northern bottle-nosed whale skeleton. The whale skeleton arrived at the Museum in the forties dismantled into several parts, and until now only the head skull been featured on display. The Whale Weekender, taking place on 8 and 9 July, will provide members of the public the chance to bring all the parts of the skeleton back together for the first time in decades. "The specimen has one of the best documented histories in the Museum. Back in the 1860s two men went on an expedition off the Somerset coast in pursuit of 'two great fish' - one of which was brought back to land and later identified as a northern bottle-nosed whale of more than eight metres long." said Jack Ashby, Manager at the Grant Museum of Zoology, part of UCL Culture. "After a period 'on tour' as a whole carcass, the prepared skeleton was displayed hanging from the ceiling of the Weston Super-Mare Museum. It eventually came to the Grant Museum in 1948, but it had been dismantled into its separate bones." Added Jack. The northern bottle-nose whale, whose scientific name is Hyperoodon ampullatus, is one of the deepest diving mammals on the planet, hunting for fish and squid near the sea floor. They are rarely seen in UK waters, however one rose to notoriety in 2006 when it was discovered swimming in the River Thames. The Museum is calling for members of the public to join its conservators in rebuilding the skeleton to discover how much of the skeleton survives today, and to take part in the cleaning process which is vital to help preserve the skeleton for the future. "The vast majority of most museums' specimens are not on public display. The Whale Weekender will allow people to get very hands-on with one of those specimens - we are really excited about it." "It will also allow us to work with the public to help protect this incredible specimen for the long-term by cleaning 157 years' worth of dust. But most of all, we want to know whether we have a complete skeleton. It's so big that we've never been able to lay it all out before!" said Jack. Over the Whale Weekender visitors will meet museum conservators and get a chance to contribute to the conservation of the specimen. Running alongside this will be a special family art installation where families can create an ocean creature to add to an underwater tableau which will grow over the weekend. Working with radio collective In the Dark, the Whale Weekender will feature a special whale themed audio cinema, In the Dark x Whales on Friday night, 7 July. The Whale Weekender will take place on Saturday 8 and Sunday 9 July between 12pm and 4pm. Admission is free and is drop in: there is no need to book. Tickets for In the Dark x Whales cost £8 and can be booked here.